When you’re creating a data visualization to tell the story of your data, you can use many content types other than text and numbers. The key is to select visuals that are not only attractive, but also match the data you have. This is not an insignificant task. Your data viz will benefit from careful consideration of a variety of different content types. Graphs: An x and y axis is used to depict data as a visualization. Diagrams: A visual that shows how something works. Timelines: A chronology is depicted on a graph to show how something happens or changes. Templates: A guide for something that a user needs to fill in or develop. Checklists: A list of tasks to be completed that can be crossed off when they have been accomplished. Flow charts: A sequential set of instructions that show how something works. Mind maps: Maps that enable you to show the big picture and the details of a topic on one sheet of paper. The main topic is in the center and the sub topics radiate out from it. 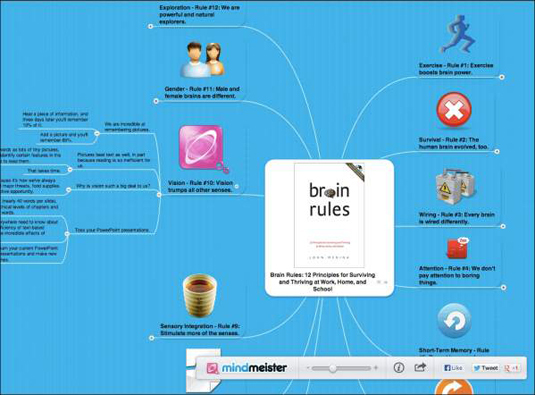 The following figure shows an example of a mind map about the best-selling book Brain Rules by John Medina (Pear Press). It was created using the MindMeister software. When you see a visualization that contains interesting content types, you should clip the image and save it to a file for future reference. That way, you’ll always have images that really inspire you. One caveat: Make sure that your data fits the visualization that you choose. Don’t try to shoehorn data in just for the sake of art.